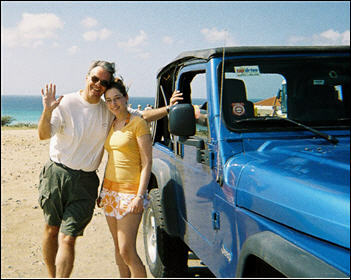 If you're cruising to Aruba, rent a car or a jeep like we did. There's no better way to explore the beautiful Aruba beaches and the rugged east coast at your own pace. Plus, it's very easy to find your way around. I found bad reviews for these : Hertz, Top Drive, Thrifty and sometimes American. If your ship is in port just for one day, don't worry. You'll have plenty of time to visit most of the island and even fit in a beach rest in about 5-6 hours. We drove off to the left of the port and made it to the California lighthouse, which you can see on this map of Aruba. We then tracked back and decided to go snorkeling right away. It was morning and less people would be on the beautiful Aruba beaches. The beach closest to the lighthouse was Arashi Beach. I am glad we went there. We spent about 90 minutes snorkeling - it was fabulous! Our ship was in port for the whole day, so we had plenty of time to discover the island. We first went back to the ship for lunch. In the afternoon we drove to the east side of the island in search of the natural bridge. Get a map from the Aruba car rental company or in the cruise terminal. Minimum age to rent a car is 21-25 and the maximum is 65-70 depending on the company. Child seats are not required by law but most companies have them available. International road signs are used in Aruba. Foreign and international driver's licenses issued by a member country of the Geneva Convention are valid. Car speedometers and road signs are in kilometers. The speed limit is 40km/h in urban areas and 60 out of town, unless specifically indicated otherwise. In Oranjestad, most of the traffic is one-way and when you get to an intersection where there are no road signs, a car coming from your right has the right of way. Driving is so easy here that you can hardly get lost. Get a map with your Aruba car rental and you'll see that road numbers are indicated on it. The only place we were confused is on the East side of the island. The map was showing the natural pool and bridge but we could not see any roads to them. And that's because there are none! All of a sudden, it's just dirt and tracks. So we followed the tracks. But we never got lost.